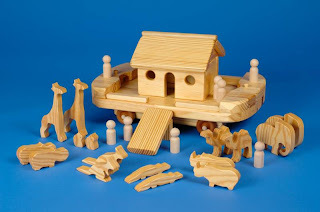 I am so pleased to be able to feature The Toycrafter on this blog. I had the privilege of seeing some of their toys at a fair at the Arboretum last year. 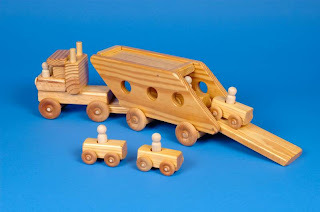 The Toycrafter makes wonderful wooden toys - the kind that don't disintegrate into a million pieces with kid rambunctiousness. Instead, these are the toys that get handed down for generations and get BETTER with age. It was really hard not to just showcase all of the toys from Dave's site. They're all just fabulous! However, I picked three of my favorites and have to be content with that. Please go to his site and browse - did I mention that he has some really wonderful toys?!?! I will definitely be looking at these for gifts this year! I think M'Lou may need Noah's Ark ... LOVE the animals! Click on any of the images to go to open an new window and go to their site.